Do You Need Mental Clarity? Your brain, just like any other organ, responds to nutritional and life style choices. Lack of sufficient sleep, poor nutrition, food additives and other chemicals in food, and environmental pollutants can reduce blood flow to the brain, and the accumulation of these as you age can take a toll. The resulting poor blood circulation causes malnourishment, denying the brain adequate oxygen and glucose, the brain's primary food. Wastes are also not removed efficiently with poor circulation. Inadequate blood flow to the brain may result in mental fogginess, poor concentration and lack of alertness. 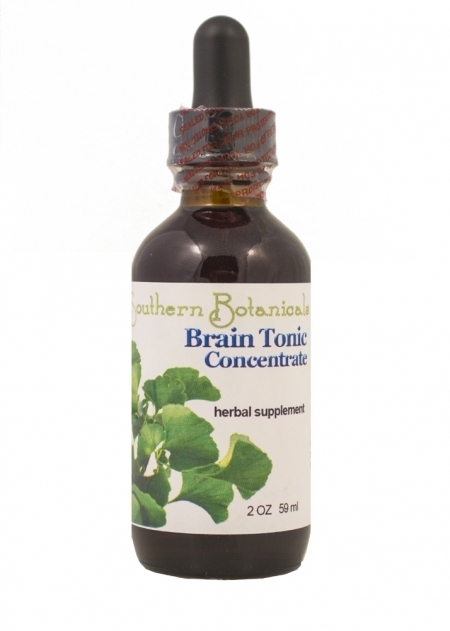 Brain Tonic Concentrate uses time-tested, proven herbs famous for their ability to revitalize the brain and bring about a feeling of well-being. The combination of herbs in Brain Tonic increase blood flow to the brain, helping to ensure sufficient delivery of oxygen and nourishment to brain cells and removal of cellular wastes. The result is an increase in mental clarity, alert memory and heightened focus. Brain Tonic Concentrate increases alertness, decreases mental fatigue, and improves concentration. It also gives support to the inner ears. These statements have not been evaluated by the FDA. This information is for educational purposes only and is not intended to diagnose, treat, cure or prevent any disease. Consult with your health practitioner if you have a health problem. I take 1 to 2 droppersful of Brain Tonic daily and chase it with a glass of water. I use it because I trade online and you have to be pretty fast. At one time I had memory problems, "Where was I going? - What am I doing?". I started the Brain Tonic and in a week it was breaking down the deposits - I could feel it. Now I take it daily and I am a lot more focused. - Vanessa B.
I started taking Brain Tonic Concentrate about a week ago when I noticed that my mind was wandering off in many directions all by itself. I hadn't been getting enough sleep because at night when I hit the bed and closed my eyes, images popped up and kept me entertained much like a movie. So I was not as alert as I needed to be. After the first dose of the concentrate I immediately regained my ability to stay focused and concentrate on what I was doing. Getting distracted was no longer a problem. And although I felt energized by the formulation, I slept much better at night too. Organic and Wildcrafted Ingredients: Ginkgo leaf, Gotu Kola, Rosemary, Kola Nut and Cayenne Pepper in a base of distilled water and certified organic GMO-free alcohol. Ginkgo leaf - The Ginkgo tree is the oldest tree on earth, originating in China. Its properties have been used by mankind for centuries to renew health. Ginkgo leaf has a documented ability to increase circulation to the brain and extremities. Ginkgo leaf has been known to enhance memory. It makes you feel good. Its energizing properties result in mental clarity and increased vitality. Numerous studies have shown that ginkgo protects arteries, veins, and capillaries from damage and also regulates their tone and elasticity. It protects red blood cells from destruction and keeps them from clumping together. It contains compounds with strong antioxidant properties which may protect cellular health and fight age related conditions. Rosemary - This herb was first used in the Mediterranean area. Rosemary leaves contain certain phyto-chemical (plant derived) compounds with known health promoting properties: anti-inflammatory, anti-allergenic, and anti-fungal in nature. Rosemary has been used for centuries to enhance mental clarity as well as memory, concentration and creativity. Gotu Kola comes from the Himalaya Mountains of India where it is believed to possess high spiritual properties. It is a general tonic and nerve tonic. It improves circulation, concentration, energy levels , intellectual skills, memory and age related problems. It's a brain rejuvenator par excellence. It also relieves negativity. Kola nut - A fruit from the African Kola tree which provides energy. It stimulates circulation and increases oxygen levels in blood. This boosts concentration and learning rate with an accompanying upbeat frame of mind. Note: Contains caffeine. Cayenne pepper - This hot pepper comes from South America. It was named after its place of origin, Cayenne, a small island off the North Atlantic Coast. The pepper increases circulation and is noted for its positive effects throughout the body.Cayenne is also a body cleanser; Its main compound capsaicin heats up your body and speeds detoxification. Cayenne also strengthens the potency of other ingredients by carrying the essential elements of other herbs and nutrients throughout arteries, capillaries and into the cellsso they are delivered to where they are needed. Consult your health practitioner before taking if you are pregnant or nursing. Ginkgo Biloba is a natural blood thinner and serotonin booster. Do not use if you are taking Warfarin or other blood thinners because of concerns about excess bleeding. Ginkgo Biloba should not be used by people who are taking certain types of antidepressants such as SSRIs (selective serotonin reuptake inhibitors) or monoamine oxidase inhibitors (MAOIs) as the combination may cause serotonin syndrome (serotonin overload) which can be fatal. Kola Nut contains some caffeine.